The Community Wealth Building strategies of BRSC follow a number of approaches that have been researched and pioneered by The Democracy Collaborative at the University of Maryland and may be found at Community-Wealth.org . For the following principles for building community wealth in the Binghamton region, BRSC is indebted to the work of The Democracy Collaborative. Leverage funding from community and local foundations, anchor institutions, and existing city business development programs to support wealth building. David Currie of BRSC gave a presentation to SUNY BEST, a Binghamton University led networking group entitled: Transactional to Transformational Change: Connecting Communities and Universities Sustainably which can be viewed here. Further detail is available in a report produced by the Democracy Collaborative called Linking Colleges to Communities and subsequently captured in the book The Road Half Traveled. In transformational engagement, the anchor institution makes a significant long-term, cultural commitment to become a real partner with the community by recognizing in theory and practice the necessity of working as equal partners to achieve mutually beneficial outcomes. This acknowledges that the anchor institution by its sheer size could easily control the agenda for its own purposes and this imbalance can result in the adoption of projects focused mostly on great research and science, but which fail to solve community problems. We observe, with cautious optimism, the growing awareness and commitment to the BU community to become more community oriented. BRSC will continue to work with friends in the faculty, administration and student body, who share this commitment understanding that this kind of cultural change is what will indeed transform BU into the kind of premier institution for the 21st century that it seeks to become. The Binghamton Neighborhood Project (BNP) is a group of faculty and students from Binghamton University (BU) that work with community partners to improve the quality of life in our area. The most distinctive feature of the BNP is its scientific foundation. An explosion of basic scientific research relevant to the human condition has taken place over the last few decades, including an integration among disciplines that is ultimately rooted in evolutionary theory. This newly derived knowledge can provide new solutions to a wide range of practical problems. In fact, never before have basic and applied research contributed so strongly to each other. This a “whole university/whole city” approach to community-based research and action. Problems are not studied in isolation but in a holistic fashion that contributes to basic scientific knowledge in addition to real-world solutions. The BNP has attracted considerable attention in the scientific and popular press, based in part on Wilson’s book The Neighborhood Project: Using Evolution to Improve My City, One Block at a Time, which was published in 2011 and won the Books for a Better Life Award in the “Green” category in 2012. BRSC and BNP have been working on projects for several years and hope to continue to strengthen this relationship among others with faculty and students. In addition, BRSC has adopted the Cleveland Model, also known as the Evergreen Cooperative Model, that is transforming a downtown neighborhood in Cleveland and includes a partnership of anchor institutions, including hospitals, community foundations, community development financial institutions (CDFIs). BRSC has been working with the Binghamton Housing Authority Federal Credit Union, which launched the CDFI movement in Binghamton in 1994, to reinvigorate the CDFI movement in Binghamton through relationship building with Alternatives a regional CDFI located in Ithaca. CDFIs fill a unique community development role by serving “economically distressed communities by providing credit, capital and financial services that are often unavailable from mainstream financial institutions” (www.cdfi.org). Beginning with the end in mind, the four impact categories provide a broad strategic framework that will focus on improving the quality of life in the Binghamton Region today without compromising the quality of life of future generations. 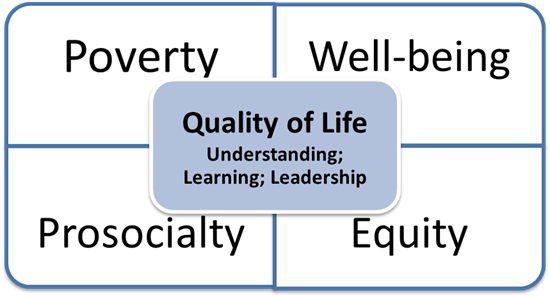 Each of the quadrants contains areas of impact where transformational engagement will have a significant impact on our individual and collective quality of life on and off campus. This includes significant contributions to the understanding, learning and leadership of students, faculty and society as we take on the challenges of the 21st century. Eliminating Poverty provides a huge aspirational goal that covers a broad range of strategies. Our well-being physically and mentally is a critical measure of how we are doing individually and collectively. Equity, our sense of being a valued member of the group and of being treated fairly, is equally important. Improving Prosociality, defined as our preference for helping others and society as a whole, is another critical measure. Positive results and trends in each of these areas can be summed up in Quality of Life, which in the US has been steadily declining since the 1950’s despite a rising standard of living.